Woven polyester-based vascular prostheses are usually coated with a sealing film. 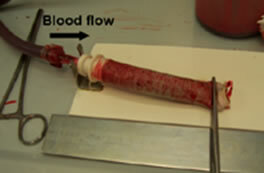 The use of a sealant clearly obviates the need for preclotting prior to implantation, to avoid leakage of blood during in vivo implantation. Collagen is advantageous as a sealant, since it also improves cell adhesion and migration onto the surface of the prosthesis, thus leading to a better integration with the host tissues. Our team investigated the optimal composition and degree of crosslinking of collagen- and gelatine-based sealing films, suitable for optimal blood impermeability (Figure 1). As an alternative to collagen, novel sealants, based on segmented polyurethane (SPU), are also being studied in our lab. The coating of the vascular prostheses is carried out with suspensions of SPU at different concentrations in dimetylacetammide (DMAc). This impregnation step is followed by the washing of DMAc with a suitable solvent, which leads to the formation of a microporous structure on the surface of the prosthesis. Such a structure is likely to facilitate cell migration and proliferation onto the prosthesis surface.